Are you getting a bit bored with Brexit? You are aren’t you? I confess to feeling a little that way myself sometimes but I always shake myself out of it – and so I’m writing this to shake you out of it too. Brexit will be a disaster for wildlife – it doesn’t necessarily have to be, you will be told, but in practice it will be, I am telling you. If we crash out with no deal then on 30 March, that’s in less than 18 weeks’ time, the Habitats and Birds Directives (and other things too) will cease to apply in UK law and we will have to rely on their transpositions into UK laws for environmental protection. And although we are told by the likes of Michael Gove that everything will remain the same on Day 1 nobody makes promises about Day 10, Day 100 or even Day 365. If we have a transition period then we keep the Directives for longer and I am really not completely sure what happens after that because it may well depend on what conditions we would have to meet in order to trade freely with the EU. You’re yawning again aren’t you? Oh dear – my fault. Just because this is important doesn’t, of itself, make it interesting, does it? I believe, and so do almost all the nature conservationists I know, that leaving the EU will be a disaster for our already-damaged wildlife. The wildlife NGOs can’t shout about that because it’s too political (and so are missing from the scene of the most important environmental choice of our time) but they are shouting about the framework we need to hold government to account when we lose our greatest means of holding government to account, namely being members of the EU. We have no certainty of getting a good framework for the future – in fact, under this government we have every expectation of getting a very poor one. That’s what you have to look forward to – weaker, much weaker, environmental protection. I don’t want to leave the EU and I don’t apologise for that. I think it would be a disaster – on many grounds not simply environmental ones. That’s why I voted Remain and my view has hardened considerably since the referendum. With a passion, I want to Remain. Now you might say that the pople voted to leave, and they surely did, but so what? The people voted to stay in the EC in 1975 and that hasn’t stopped the Brexit supporters from campaigning long and hard to get us out, has it? They would say, I’ve heard them, that the situation is very different now with a larger EU and a more political union and that therefore the people should decide. It’s a point of view. But what’s sauce for the goose etc and the situation has changed very dramatically since the weeks before the referendum so we deserve the chance to have another think. Things have changed – the promises of the Brexiteers have been shown to be utter hot air (and indeed downright lies in many cases), the vote seems to have been tampered with through illegal behaviour and the behaviour of many leading pro-Brexit MPs has shown them to be an untrustworthy rabble. The Brexit deal is rubbish and it doesn’t look like MPs are able, partly because of the two-party system meaning that Labour is playing politics, to sort it out. So, yes, let’s have another referendum – and that’s why I do support the #peoplesvote campaign. And if we did, then for heaven’s sake, and our own, and that of the disenfranchised nature around us, let us vote to Remain. Totally, totally agree with everything you say Mark. I have always thought and said that leaving the EU would be a disaster for our wildlife. One cannot trust a word of what our politicians say these days. As I have said I think one of the hidden aims of many in the Tory Party is to be rid of the EU Habitats and Bird Directives as well as having to carry out Environmental Impact Assessments for proposed developments. All I hope is that is the leaving agreement fails to pass in the House of Commons and a second referendum, which so many people want, is forced upon this terrible, undemocratic Government. My MP won't support the PM, not because he thinks it will be the disaster Mark believes, but because he is on the hard side of the argument, and is concerned we may still have Johnny Foreigner fishing our seas. I think if we leave it up to him and his ilk, we won't need any UK fishermen to search for the last fish around our seas, as it will be a red tape free 'fish until the last one is gone' attitude under their management. Brexit is an act of monumental stupidity but the climate breakdown that is now clear for all to see will have a far greater impact. Habitats and wildlife populations will change detrimentally at a far greater rate than any number of directives and any pile of money can off-set. Brexit is just a distraction at the time we don't need one and we should all be getting behind Extinction Rebellion's call for our government and governments worldwide to declare a state of emergency. This is a unique situation in that the information now available to people to make a decision is so much greater than it was over two years ago. Many of the people who voted both for and against Brexit are unhappy with the current deal. If, and it's quite a big if, but if 54% of the people would now prefer to remain, based on what we now know, how could that possibly be considered undemocratic? Of course the risk is that another vote results in a hard Brexit but if that's what people want then fair enough - it would be fair and democratic. I very much agree. One of the long term beefs of the Euro-sceptics/Brexiters has been the excessive (as they see it) amount of regulation and red-tape emanating from Brussels in areas such as environmental protection, health and safety, consumer protection and such like. They are itching to pull down all of the accumulated legislation which they paint as an unnecessary burden on business. The likes of Liam Fox are wedded to a vision of minimal regulation and once we are out of the EU I have no doubt that they will lose little time in beginning the process of removing or watering down what they see as 'gold-plated' environmental protection laws (to use George Osborne's term) if we let them get away with it. Of course, some legislation is not as effective as it might be and some, doubtless, is over-complicated so it is possible that there will be opportunities to simplify and improve existing laws but in my view it is sheer fantasy to believe that in the absence of a strong regulatory framework, businesses will provide adequate protection for wildlife, air or water quality etc. We will be in a race to the bottom and those who consider they have been inconvenienced by the Great-crested Newt for too long will be all too happy to kick it out of the way. What is increasingly clear is that the Brexit vote was as much about George Osborne's austerity as it was about Europe - it was a vote against this frightful Conservative Government which has set out to persecute the poor and disabled and benefit the rich. You are just about safe in this country now if you are in the top 1% of the population in terms of wealth/prospects - otherwise beware. Leading on from there, the basic philosophy of today's Conservative party guarantees damage to wildlife because short term gain for the richest and most powerful is central to their beliefs. The critical battle is around agriculture where the traditional farming voice says what it always says - intensify. It won't save farming - behind the public rubbish farmers are bolting for anything other than mainstream production. I remain appalled by how many in conservation seem to believe that all our current farmland must go on as intensive farming - and go on about how much what we need to restore biodiversity is going to cost. It doesn't have to - the collateral damage from intensive farming continues to grow and with it the risk of catastrophe, lethal flooding, for example. The authoratative Natural Capital Committee has shown how 500,000 hectares managed for other aims, things we need urgently today would give a big economic gain, not loss. "this frightful Conservative Government which has set out to persecute the poor and disabled and benefit the rich." 2 the Tory party is like Devon cream-- Rich, Thick and full of clots. or as one old Labour MP once put it-- No Tory can see beyond the £10 note on the end of their nose. Nothing has changed since Nye Bevan ( one of my few political heroes) called them " Vermin"
Paul, I don't think Tory-bashing really gets us anywhere. There are some good Tory MPs and we are going to need the support of quite a few to get us out of this appalling mess. My young Tory MP is actually a well-intentioned sensible bloke who supported remain but I guess he would be deselected if he backed a new vote - I keep writing to him though. Completely agree with Mark's blog. May is driving me mad! It’s very interesting that here in Henley the Henley Standard has carried out a poll and finds that 89% of those polled say there should be a Second referendum and Henley is not noted for not towing the line of the Tories. Agreed. Up to now this government has concentrated on hollowing out the regulators (and other public bodies they dislike) by cutting funding because abolition was Impossible if they were to meet EU obligations. That will no longer be the case if we crash out and we'll be sold a catastrophic 'Dig for Victory' type campaign as an excuse. At last, a conservationist calling out Brexit as the omnishambles it was inevitably going to be! But Brexit itself is just a dead cat strategy. Our biggest problem - because the damage is already done - is Austerity. Austerity 1.0 has run out of momentum, Austerity 2.0 (aka Brexit) is needed to prevent the undoing of that project. Even if we stop the disaster that will be Brexit, we will still have a regime that has completely eviscerated funding for our National Parks, AONB's, NNR's, our environmental agencies (see Andrew Sells @ EFRA committee), and decimated five times over our local authorities. Our ranger services, country parks and environmental education efforts have suffered at the expense of statutory requirements. 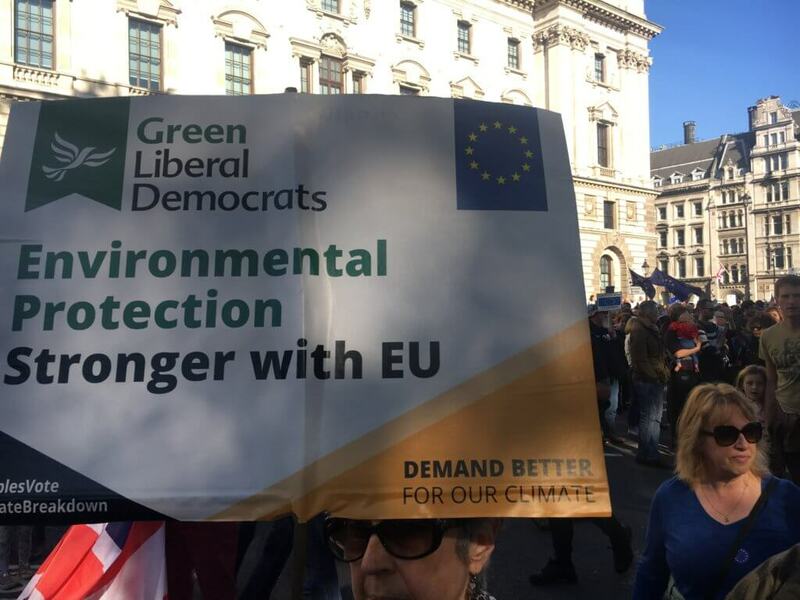 Just stopping Brexit, we will still have a society where so many people are living hand to mouth, preoccupied with food, job insecurity and paying heating bills that they won't sign up to protecting our environment. And we have a generational divide now which cannot heal itself. How can we achieve a sustainable society if Baby Boomers have been largely cocooned by Austerity whilst everyone else has been impoverished by it? We are of course supposed to think it is invasive aliens that are the source of our problems. Divide and Conquer. I think it is time we recognised that the post-war settlement (that gave us the National Parks Act) is dead. This consensus been torn up by people who will trample on us and the environment entirely because they enjoy the power (what else actually is Grouse shooting and Fox Hunting?). I agree totally with what you and others here are saying. I'm not bored with Brexit. I get more annoyed with the present situation, and with most politicians who promote any and all views apart from the one you are suggesting. The majority of the public know you are right. Another referendum would not be an affront to democracy - far from it. I concur too, Mark, Alex et al. The result of the referendum evoked a feeling of grief in me - and as the daughter of a Scottish mother, it's even worse. The animals and the environment will all suffer because we have such an appalling coterie of clowns in parliament who, barring a few thoughtful MPs, such Caroline Lucas, Kerry McArthy, Angela Smith, Rachael Maskell + a few more, don't give a damn, and not enough constituents make them care about anything but potholes and dog owners not picking up the muck. I don't know if a second referendum will help. It would be terrible to have a similar result again - and that might happen. This chimes in with your blog last week about the Oxford to Cambridge Expressway. The government thought they could get away with ignoring the necessary environmental assessments because a few months on they could safely be ignored anyway. How can i be bored of the most important decision England and Wales have ever made since 1939 (excepting any on climate change) and which will drag Scotland out against its wishes. The drinks industry will be happy. Prasad - it is though, a parody account. 'It should have been true'. If only the self-serving MP's would remember that they represent us. If there is a groundswell of opinion that we should have a second vote, then they should support this. The problem is that they are more interested in towing the party line and safeguarding their careers than looking after the environment. Regrettably our Henley Tory MP is very much a toe the party line subscriber, even though he voted remain along with a significant percentage of his constituents. His neighbouring MP is, of course, Mrs May. Incidentally he promised me a reply to the People's Manifesto for Wildlife, on 18th Oct. I still await his cut and paste response. What is new, now, is that there is a persuasive case that a second referendum - putting the 'deal' to the people - would a better way of healing Brexit divisions than any of the other ways out of the present impasse. Sorry just thought this thread needed a bit of balance. Julian - it's nice of you to apologise for being a Conservative but that's really not necessary. No deal is 100% not fine even my Tory MP has publicly stated that he will do everything in his power to stop No deal happening he will vote against it. Have you read Govt impact assessments which has every region of U.K. Economically worse of than Remain in EU but under No deal the North East will suffer an 8% downturn in the economy. I haven't fact checked this bit but have been told that is worse than recession under Thatcher. I do chortle at the idea that the EU has been a boon for the environment! The EU's CAP has been by far the biggest driver of ecological degradation,species decline and extinction, natural habitat removal etc. By subsidising the over stocking of the uplands with sheep, paying farmers to drain wetlands, ponds, cut down woodland, grub up hedgerows, gouge tracks over moorland, put up fences where no fence has ever existed. All because production and profit trumps environmental protection in the insane world of the CAP! John - thanks for your comment. The CAP has been bad but UK governments have to take a large share of the blame too because for decades the CAP has enabled member states to implement agri-environment schemes which could have made things so very much better (not perfect, but better). Successive governments have failed to bring in a-e schemes that work for farmers, taxpayers or wildlife. In England, the HLS was/is good but the Entry Level Scheme was very poor for wildlife and we have only ourselves to blame for that. And the same UK personalities, organisations and system are now going to deliver a wildlife-rich countryside are they? I do hope so, because there is an opportunity, but it is not by any means certain, is it? What surely is the case is that the most ardent Brexiteers politicians - are the ones most anxious to tear up environmental and other regulatory protections. Gove may be an exception, who knows. But given the dynamics in Westminster, if Brexit goes ahead, it will be those people calling the shots. So CAP = bad therefore EU = bad? The high season for ploughing up our downs, heaths and hay meadows took place in the 1950's and 1960's when Whitehall had its own system of agricultural "support". For example "the 1952 Agriculture (Ploughing Grants) Act set two rates for ploughing up grassland, the higher rate of £30/ha (£430/ha, today's equivalent) for removal of at least 12 year old, grassland". Perhaps we can conclude Agriculture (Ploughing Grants) Act = Bad therefore British Gov = bad? I for one know that our environmental challenges can only be solved by working together with our neighbours. The worst approach to our environmental challenges is to resort to isolationism, nostalgia and unregulated neoliberalism. DG, very good point and one that I was going to make before I read your comment. Hedgerows being grubbed out under CAP doesn't fit with the facts. Most field boundaries were lost in the late 1960,s under MAFF drainage grants. So long as we are addicted to cheap food Brexit or Remain is not going to change how we value land or food production, if you had to single out the one overriding factor that has driven this change it is unit cost of production. If you want to fix it or at least conserve what we have you have to see the problem for what it is. No NGO has ever really understood the links between cost of production, profit, subsidies and environmental outcomes. Comments like "well we have paid all those subsidies so by now we must own the land really so farmers should just do what we want" are pitiful in their total inability to grasp the reality which faces the industry and what wildlife we have left. They ignore the global reality of food production, dismiss the social and wider economics of subsidies and ignore the political motivations which drive global food production. The arguments become more and more secular, the mainstream becomes more and more alienated and the solutions look further and further away. The hard data provided by BTO shows that changes in farming policy following our joining the common maret were devastating to our farmland birds. The same pattern has been repeated in Spain and Poland. There has been no significant recovery for most species. Perhaps EU policies have protected our wetland birds, but what have they done for the uplands? I just don’t see EU as the saviour of our wildlife. I agree a final referendum would be the best way to settle the fertiliser we are in. The people voted to remain in 1975 so we remained - and people had the right to continue campaigning to leave. The people voted to leave in 2016 so we should leave and people will have the right to campaign to join again.